Finding kids electric cars can be a real challenge because of the overwhelming number of options that are available. Well, that’s why we’ve researched the top options and put together this extensive review. The hard part has been done for you. All you need to do is have a read through the electric toy cars below and select the one that you think your child would have the most fun with. A buying guide section is also available at the end to provide you with additional information to help you feel confident about your final pick! 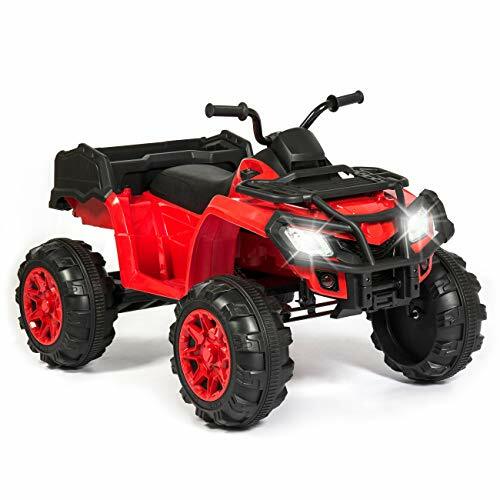 The Rosso Motors Kids ATV Quad 4 Wheeler has a 500W motor that’s powered by a 36V battery, which provides kids with plenty of power to have a blast with. We liked how this one has been made for the outdoors as it enables kids to be out in the fresh air more often. There area rubber tires that have been specially created to withstand all kinds of terrain. They’ve also implemented a fantastic shock absorbent suspension system that works effectively to keep the ride smooth on rougher surfaces. You can also feel confident that your kids will remain safe while riding this one. This is a result of the high-quality disc brake system. It’s incredibly reliable and works to bring your child to a safe stop. Kids have a blast being able to play outdoors for hours with this one. The braking and suspension system work well to keep the ride smooth and safe for your child. 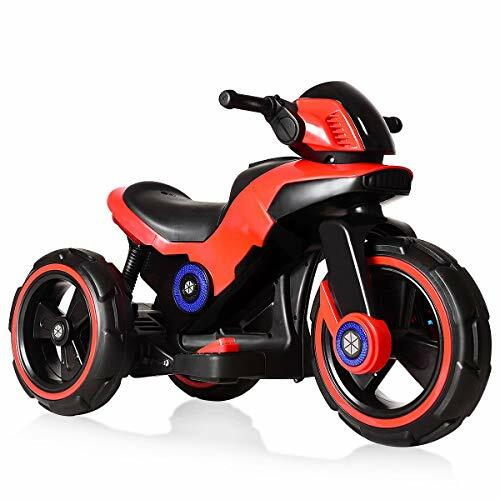 This is another Uenjoy Kids toy that’s a Motorcycle that features training wheels and a suspension system. As a result, you don’t have to worry about your child trying to balance themselves on a 2-wheeler. The suspension also works well to ensure a smooth and safe ride. The 2 training wheels are smaller and the main 2 tires are larger to keep the motorcycle upright at all times. Kids are able to travel at speeds between 1.8 and 3.2 mph. This is a safe speed that still lets them have a lot of fun. To fully charge the battery it takes around 8-12 hours. This provides kids with around 1 hour of continuous play, which is plenty. 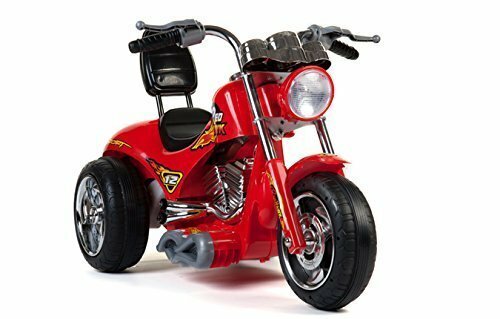 This is a fun motorcycle power wheels toy that lets kids ride around with a lot of stability due to the training wheels. 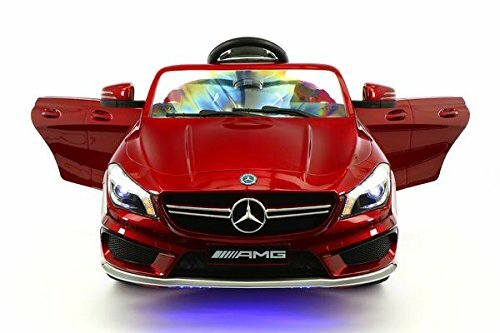 This Mercedes SLS Final Edition Car comes with a battery that powers 2 motors and enables kids to travel at speeds between 2 and 5 mph. Children are also given the opportunity to choose between 3 different speed settings, as well as a reverse function. The soft start button makes it super easy for kids to use and play independently. We also liked how the electric braking system is reliable and works effectively. They’ve used high-quality PU leather materials to make the seats, which keeps kids comfy for hours of play. A 5-point safety belt is available too which keeps kids safe while driving around. We also liked how there are rear and front shock absorbents available, as well as rubber tires. These provide the car with more durability and a smooth riding experience. The design of this one makes it feel realistic for kids to play with, which is great for their creative play abilities. With an awesome suspension system and high-quality tires, your kids will have a lot of fun driving around smoothly. 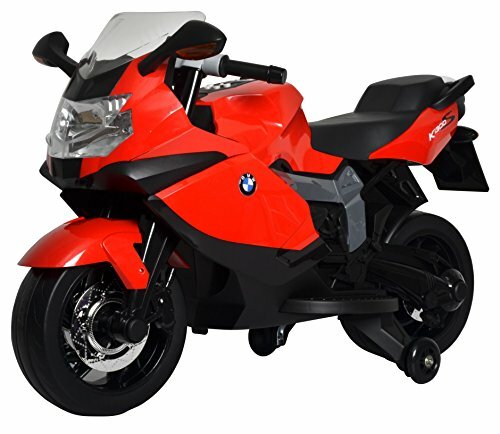 The Big Toys Direct Red Hawk Motorcycle is powered by a battery and features 2 speed modes. These modes include low and high and allow kids to travel between 2.5 and 5 mph. There’s also a reverse function available to help get them out of tricky situations. The tires that they’ve fitted to the bike toy included rubber traction strips. These work effectively to provide each of the tires with traction to ensure that your child has complete control. There are also 3 tires available which keep the motorcycle toy upright for safety. We liked how they’ve incorporated a working horn and sound effects. These add a more realistic element to the toy that encourages kids to play with more imagination and boost their creative thinking skills. This is a super fun motorcycle toy that lets kids play with a lot of creativity due to the realistic sound effects and working horn. This BMW Motorcycle features working headlights, as well as a horn. These features are awesome for making the toy feel realistic, which inspires kids to play with more creativity. The battery that powers this toy allows kids to choose between low, medium, and high settings. The accelerator pedal provides them with the ability to control how fast they travel. We also liked how they included a remote as it lets parents have total control over the toy. As a result, you can easily keep your child out of danger. A music feature is also available which lets kids listen to music while riding around. 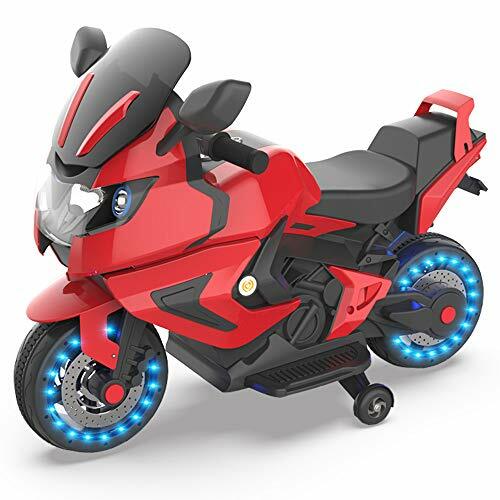 Children have a blast riding this motorcycle toy and being able to play with tons of creativity due to the realistic design and sound effects. 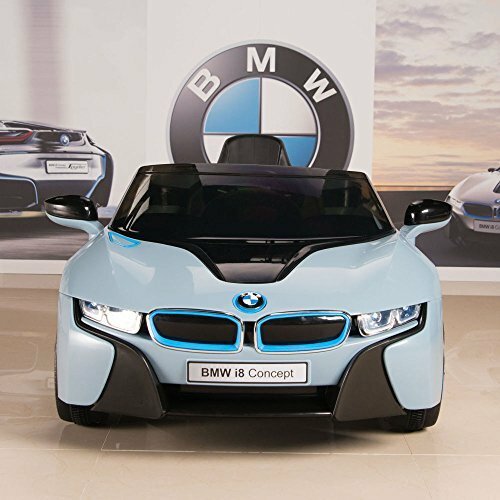 The Big Toys Direct BMW i8 comes with a battery that powers the motors and lets kids choose between 2 forwards speeds, as well as a reverse function. Kids are able to easily control this one as a result of the responsive steering wheel and the pedal for acceleration. However, it also comes with a remote that parents can use to control the car toy at any time. As a result, you can feel confident in knowing that you can keep your child out of harms way. We liked how it mimics what the real car sounds like when you start it up. This makes it more realistic for kids to play with, which is great for inspiring them to be more creative. In addition to this, there an MP3 input that lets kids listen to music while driving around. Children have been loving how they can ride around in this pretend BMW i8 and feel like they’re in the real thing as a result of the realistic start-up sound. 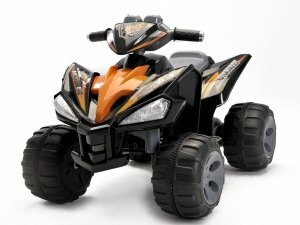 This Kids Quad ATV is powered by a battery that enables kids to travel at speeds between 2 and 4 mph. There are 2 speed settings available for them to choose from which include low and high. A reverse function is also available which is handy for tricky situations. Kids are able to keep control over the toy by using the foot pedal to accelerate. There are tires that have rubber traction strips around them too. These work effectively to provide your child with plenty of stability while riding around. We were also impressed with how there are working headlights and a horn. These features make it feel more realistic for kids, which boosts their ability to play with more creativity. This is an excellent toy that lets kids have a lot of creative fun as a result of the working horn and headlights. 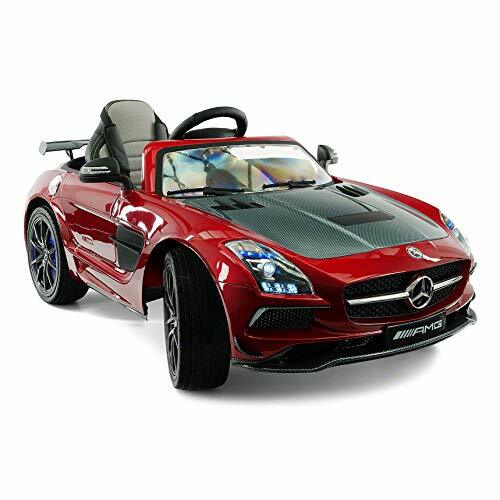 The Moderno Kids Kiddie Roadster is powered by a battery which lets kids travel at speeds between 2 and 4 mph. There are 2 speed settings available for kids to select. However, there’s also a remote control available for parents that lets them choose a 3rd speed setting. So, parents are provided with the reassurance that they can keep their kids out of harms way by having control over the toy car. It can also be easily reversed to get kids out of tricky situations. The soft-start button makes this super easy for kids to use and the electric braking system is very reliable. We also liked how the wheels come with traction bands to provide stability while driving. Kids have been loving the MP3 input as it lets them listen to songs while playing. Parents are able to keep their kids out of danger by using the remote to control this toy. The music features and ability to drive around on their own make this one a lot of fun for little kids to play with for hours on end. This Best Choice Products Kids Truck has a steering wheel for kids to turn in any direction they like, as well as a foot pedal accelerator to control the speed. Kids can choose between low, medium, and high speeds. 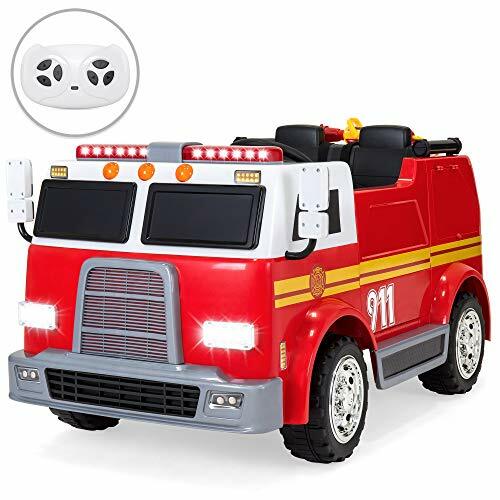 We liked how they provide parents with a remote as they’re able to take control over the truck toy to prevent any accidents. They’ve implemented a high-quality suspension system as well as high-traction wheels that enable kids to ride around outdoors and over rougher terrain. This encourages them to explore and be outside more. A seat belt is also available to ensure your child’s safety. In addition to this, there are exciting LED lights available as well as an aux input that lets kids listen to music while driving around. Kids love using this ride on toy to go across different terrain and explore the outdoors more. Parents like how they can keep their child safe with ease as a result of the remote that’s included. 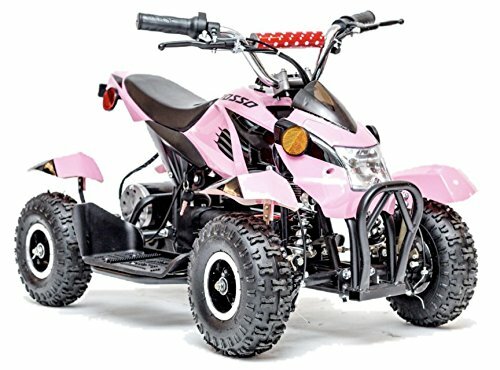 The Best Choice Products 4 Wheeler features a 4 wheel suspension system which works well to provide the toy with stability while on rougher surfaces. There are also special wheels which have been made to withstand trickier terrain, which lets kids explore more. We liked how there are working headlights and a horn available. These make it more realistic for kids to play with, which is excellent for their creative thinking skills. There’s also a storage basket available that lets kids carry around different toys. The 12V of power available enables kids to travel at a top speed of 4 mph. They can choose between 2 speed options which include low and high. In addition to this, there’s a built-in MP3 player available that lets kids listen to music and ride around. Kids have a lot of fun being able to explore off-road terrain with this one as a result of the suspension system and high-quality tires. This Kid Fire Engine Truck Toy features a pretend water hose, LED headlights, fire engine sounds, and a microphone that works. All of these features make the toy feel incredibly realistic to play with, which inspires kids to play with a ton of creativity. A remote control is available to let parents keep control of the toy. This is a great feature that parents have been loving as they can easily keep their kids out of danger. A seat belt is also available to keep your kids even safer. Children have the option to control the Fire Engine Truck toy themselves too. They can choose between the 2 speed settings available which is great for their independent play abilities. In addition to this, there’s an aux input which lets kids listen to their favorite music while riding around. 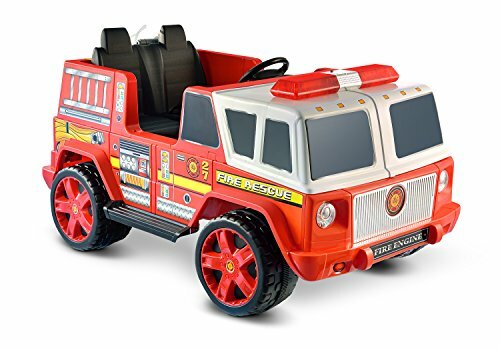 The fire engine design and sound effects available with this one make it super realistic for kids to play with, which is awesome for their creative thinking skills. This 12V Ride On Truck comes with a foot pedal that kids can use to accelerate the vehicle, as well as a steering wheel that enables them to turn in any direction they like. There’s also a remote control included which provides parents with control over the toy. Therefore, you can be sure to keep your child out of danger by taking control. The plastic body has been made out of high-quality materials that ensure the toy remains durable. 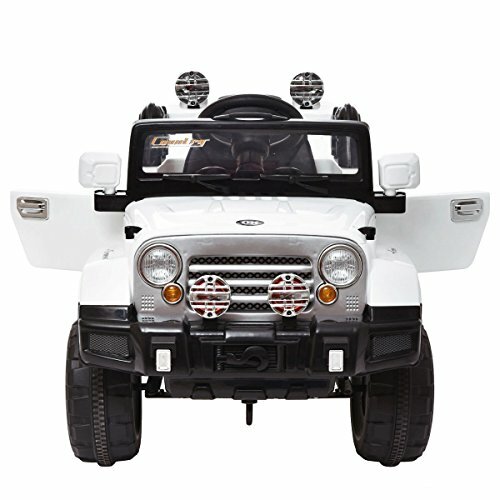 There are large wheels and an excellent spring suspension system that enables kids to drive the ride on toy outdoors on rougher terrain. We liked how there are 3 speeds available for kids to choose from. They include low, medium, and high, and you can set the speeds depending on your child’s experience level and age. In addition to this, there are awesome LED lights and a music feature that make the electric car toy more fun to play with. Children have been having a blast with this ride on toy and being able to drive around with the LED lights and music playing. Parents are given a peace of mind as a result of the remote control that’s available as well. This Moderno Kids Mercedes CLA45 Children’s Ride On Car features 2 speeds that kids can choose which lets them drive between 2 and 5 mph. There’s also a reverse function available that helps kids to get out of situations where they may be stuck. They’ve also included a parental remote provides parents with a 3rd speed option which enables them to supervise how fast their kids can travel. This provides parents with the assurance that they can keep their kids safe. There’s a soft start feature that’s easy for kids to use, as well as an electric braking system. This works effectively to bring the toy car to a stop every time. The 5-point seat belt that’s available is great for keeping your kids safe too. The spring shock absorbers that are fitted work to keep the car moving smoothly over rougher surfaces as well. This is an exciting electric car toy that lets kids ride around freely and choose different speed settings. The remote ensures that parents can have total control to keep their kids out of harms way. This Costzon Kids Motorcycle has a 3-wheel design that works effectively to provide your child with more balance while riding it. As a result, the toy is not prone to tipping over to enusre your child’s safety. Kids are able to use the pedal to accelerate the toy forwards and turn the handlebars to move in different directions. We were impressed with the colorful design and how they’ve implemented working headlights. This is a realistic feature that encourages kids to play with more imagination and boost their creative thinking skills. Furthermore, an MP3 player is available to let kids listen to their favorite music while riding around. The 3-wheel feature ensures that kids are able to ride around safely. Due to the music feature and realistic headlights, they’re also able to play with a ton of imagination. 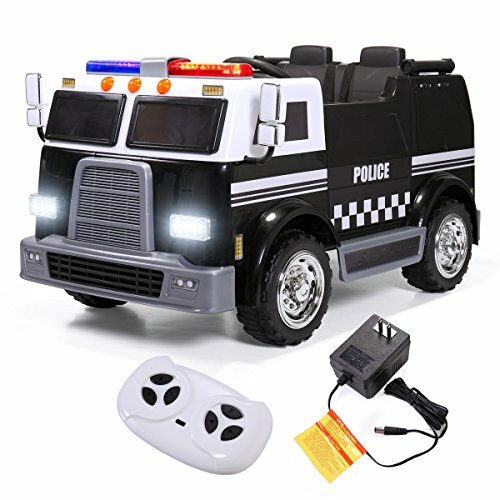 The JAXPETY Kids ride On Police Truck Emergency Engine Toy features a range of realistic sound effects and flashing lights, as well as a fantastic design. As a result, kids have everything they need to feel like a real officer and play with a lot of imagination, which is excellent for their creative thinking skills. There’s a steering wheel to let kids control the direction of the toy, as well as a foot pedal for acceleration. In addition to this, they’ve included a remote that provides parents with control over the toy car. Therefore, you can feel confident in being able to keep your child out of danger while they play with this one. We also liked how they’ve implemented a 4 wheel shock absorbent system which lets kids drive around smoothly. This is an awesome toy that lets kids play with a lot of creativity due to the realistic design and sound effects. 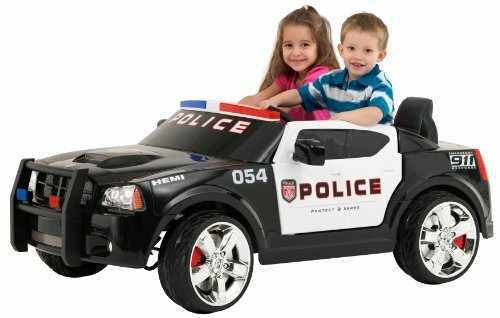 The Kid Trax Charger Police Car is powered by a battery that lets kids travel at speeds between 2.5 and 5 mph. There’s a reverse function available that makes it super easy for kids to get themselves out of tricky situations. We were impressed with how 2 kids can sit in this one at the same time. It enables kids to play with friends and siblings, which is awesome for improving their social skills. There is also a range of realistic sound effects and flashing lights available. These features make the toy feel more real which encourages them to play with more imagination and boost their creative thinking skills. The Power Trax rubber that has been used for the tires ensures that kids can drive it on rougher terrain and still have total control. Kids have been having a blast being able to have a friend or sibling sit beside them in this toy. It’s great for developing their social skills. This Kid Motorz Fire Engine ride on toy is another one that lets 2 kids sit in it at the same time. Children have a lot of fun with someone else sitting next to them and it’s a fantastic way to encourage them to develop their social skills. We were impressed with how there are realistic siren effects available. These realistic features help encourage children to play with a lot more imagination, which is excellent for developing their creative thinking skills. Children are also able to choose between 2 different speeds that let them travel between 2.5 and 5 mph. A reverse function is also available and can be handy in different situations. The design and realistic sound effects of this one encourage kids to play with a lot of creativity. Furthermore, the 2-seat feature means kids are able to play with friends and improve their social skills. Children have been loving this Explorer Truck as it lets them sit with one other sibling or friend. As a result, they’re able to have a blast driving around together and improving their social skills. The aux input lets them play their favorite music too. There are 2 speeds that kids are able to access that let them travel between 2 and 5 mph. However, there’s also a remote available that includes a 3rd option that parents can use. This remote provide you with an effective way to keep your kids out of harms way. The working LED lights and doors that can be opened and closed make the toy feel more realistic for kids to play with. As a result, you can expect their creative thinking skills to be developed well. This is an excellent 2-seat ride on toy that lets kids play creatively together for hours and develop their social skills. 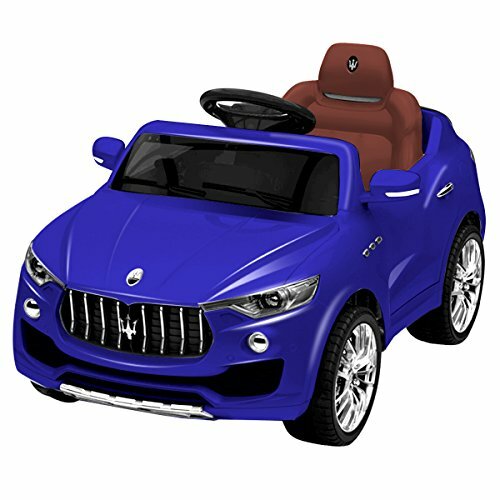 The Costzon Kids Ride On Car allows kids to use the electric foot pedal to accelerate and the steering wheel to move in any direction they like. We liked how they’ve also included a remote that parents can use to take control of the toy. Therefore, you can have a peace of mind in knowing that your child will be safe at all times. After being fully charged, this toy can last for around an hour of continuous play, which is plenty of time. There are realistic headlights available that make the whole experience more believable for kids. As a result, they feel encouraged to play imaginatively and improve their creative thinking skills. In addition to this, they’re included 4 tire suspensions that work effectively to provide the toy with stability. This lets kids ride across rough terrain with smoothness. This is a fun ride on toy that comes with realistic features that encourages kids to play imaginatively. 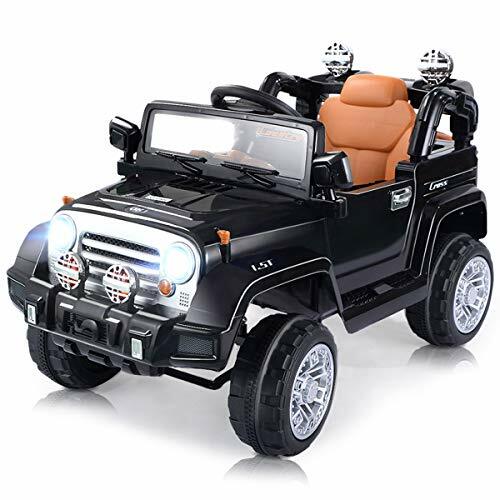 This Costzon Ride On Jeep Car comes with a remote that parents can use to control the car at any time. Therefore, you can be sure to keep your kids safe while they drive around in this one. However, it also gives kids the freedom to ride around independently too as they’re able to use the electric foot pedal and steering wheel. After being fully charged, this toy is able to last for 60 minutes of continuous play, which is plenty for kids. We liked how they’ve included a seat belt for safety and used high-quality materials to make the seats comfortable. There are low and high speed levels which let kids travel 3-5 mph. There’s an MP3 input available which enables kids to listen to songs while driving around. We also liked how there are working headlights and a horn available. Kids have a blast using these features and it encourages them to play with more creativity. The working headlights and horn make the car more realistic for kids to play with, which helps them to play with more imagination. This Costzon is powered by a 6V battery and comes with a remote to allow parents to have control over the vehicle. Therefore, you can feel confident in knowing that you can keep your child safer. Kids are also given the opportunity to drive around on their own by using the accelerator and steering wheel. When it has been fully charged, kids are able to play with it for 60 continuous minutes, which is a lot of playtime. The seats are comfortable and there’s a seat belt to keep your child safe. We were impressed with how this one comes with Bluetooth which lets you connect it to various devices to let your kids listen to their favorite songs and drive around. In addition to this, there are working headlights which make the vehicle a lot of fun to play with in the dark. We liked how this one is enabled with Bluetooth as it allows you to connect it to a variety of devices to play songs while your child rides around. 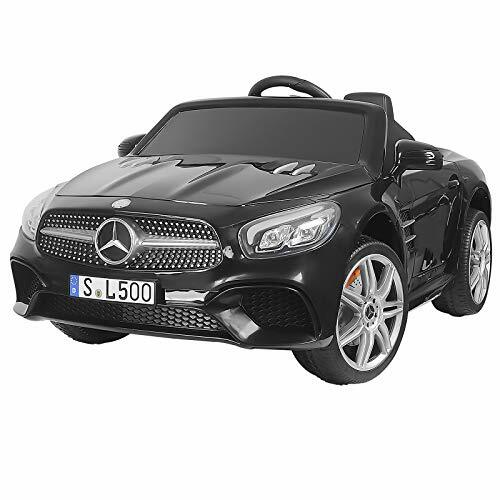 This First Drive Mercedes Benz SL65 Black car toy lets kids sit in and ride it independently by using the foot pedal that’s available. However, parents are also given the chance to keep control of the car by using the remote that’s provided. Therefore, you can be sure to keep your child out of harms way. There is also a seat belt that can be adjusted to keep your child safe at all times. Kids have been loving how there’s even an MP3 input that lets them listen to music while driving. In addition to this, there are dashboard lights as well as working headlights. These features make the car toy more realistic for kids to play with, which is awesome for their creative thinking skills. The light features and design of this one make the experience more realistic for kids which inspires them to play with a lot more imagination. 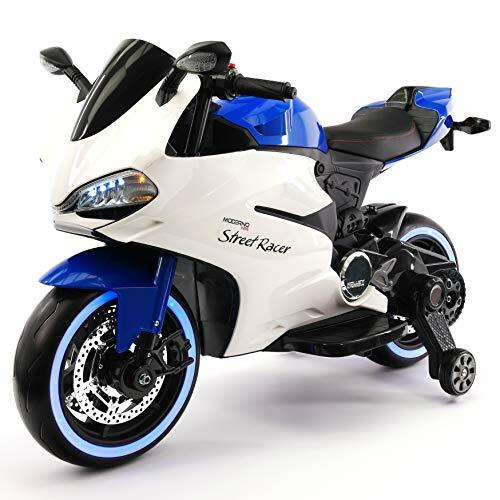 The Street Racer Electric Kids Ride On Motorcycle toy comes with 2 speeds that include high and low and enable kids to travel at speeds between 2 and 5 mph. There’s also a reverse function available which can come in handy. Children are able to easily start this toy by using the soft-start button. We also liked how the electric braking system is reliable and brings kids to a stop every time. In addition to this, they’ve implemented excellent spring shock suspensions that work to provide kids with a smooth ride. The tires have a lot of traction to provide kids with more control over the toy motorcycle. Moreover, they have a blast being able to listen to music by using the Bluetooth feature and connecting it to various devices. Kids have a blast being able to choose between the different speed and reverse options to play outdoors for hours. The Bluetooth feature lets them listen to their favorite songs while playing too. The Dporticus Kids Electric 2 Seater allows 2 kids to sit in it at the same time. This is a super exciting feature that lets kids play with siblings and friends which can be effective for improving their social skills. There’s an MP3 music player available that lets kids listen to music while driving. We also liked how there are working lights and doors that can be opened and shut. these are realistic features that encourages kids to play with more imagination. Parents have been glad to discover that a remote is included. This lets them take control of the toy car at any time to keep their kids away from danger. Seat belts are also included for additional safety features. The 2-seat feature enables 2 kids to play together in this ride on toy and have a blast for hours of creative play. Your child’s social skills are given a great opportunity to develop with this one! 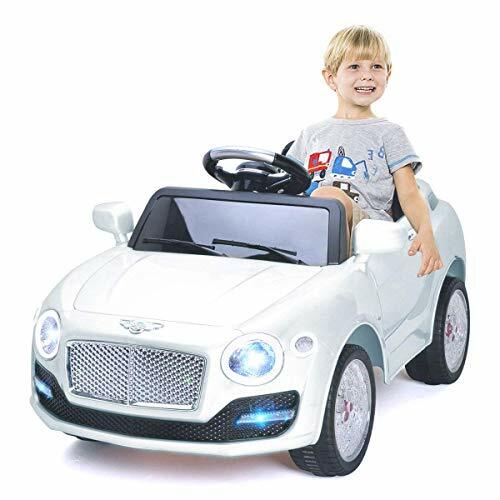 The Best Choice Products 6V Ride On Car Truck comes with a foot pedal that provides kids with the ability to control the speed. The top speed is great for younger kids as it can travel at up to 2.5 mph. A remote control is available to let parents take control too. Therefore, you can be sure to keep your little one safe at all times. This remote also provides you with 3 speed settings, as well as a reverse function to get your child out of tricky situations. An aux input is available that allows kids to play music while driving around. In addition to this, there’s a working horn and set of headlights that make the toy feel more realistic to play with. As a result, kids are inspired to play with a lot of creativity. The working headlights and horn are awesome for encouraging kids to play with more imagination and use their creative thinking skills. This Lamborghini Aventador is a battery powered ride on toy that comes with 2 different speed settings. The lower one lets kids travel at 1.9 mph and the higher one provides them with a top speed of 3.7 mph. There is a reverse function available too in case they get stuck in any situations. We liked how the suspension system that has been fitted lets kids drive around on bumpy terrain with smoothness. We also liked how there’s an aux input available that lets kids listen to their favorite music. 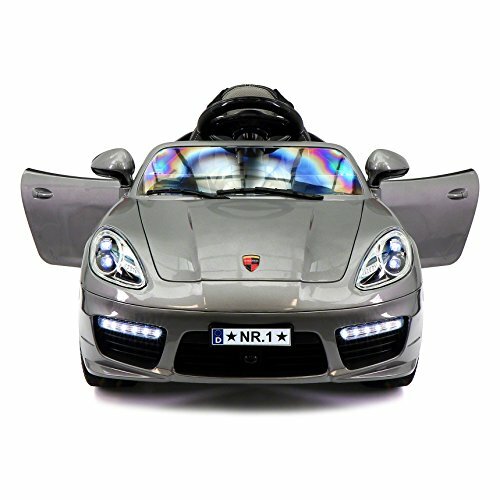 There are LED headlights and a working horn available which encourages children to play with a lot of creativity. The doors also open up like the real Lamborghini doors do too! These realistic features make the vehicle more realistic for kids to play with and they are entertained by it for hours. 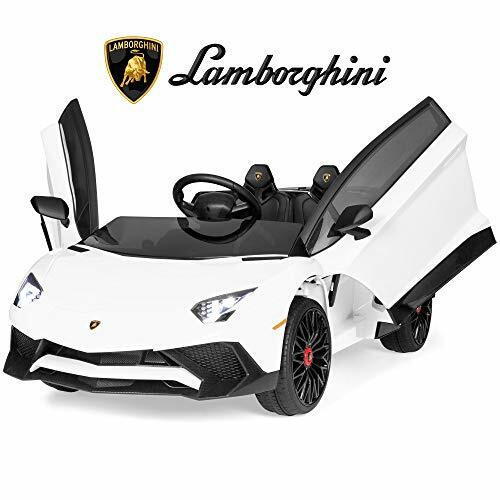 Kids have an absolute blast riding around in this Lamborghini electric car and experiencing all of the realistic features. It encourages them to play and think with more creativity. 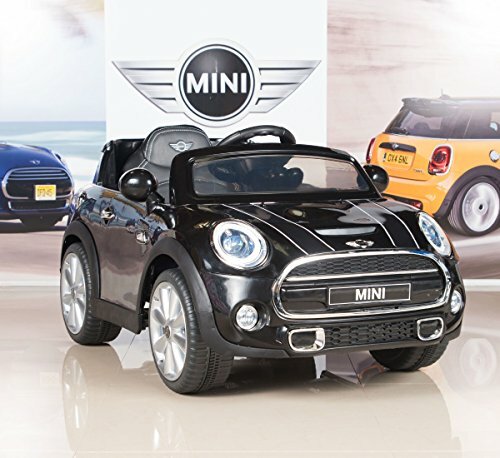 This BigToysDirect MINI Cooper Kids Electric Ride On Car has been fitted with high-quality leather seats. Therefore, kids are able to sit in the car and play comfortably for a long time. Starting up the electric car is easy for children as a result of the push-start button. Kids can control the speed of the car by using the pedals and they’re free to turn it in any direction that they like by using the steering wheels. Parents have been glad to find that there’s also a remote available as it enables them to have control over the car and keep their kids safe. There’s an MP3 input that lets kids listen to songs while driving around which is a feature they’ve been loving. In addition to this, there are working headlights and horn which make it more interactive. Kids feel like the toy is more realistic which inspires them to play with a lot of imagination. 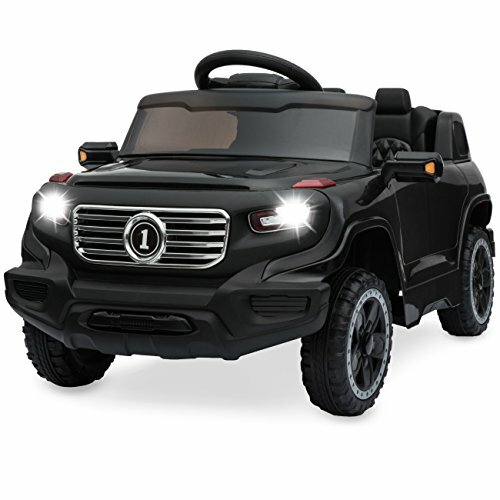 This is an excellent electric car for kids that comes with realistic headlights and a working horn that encourage them to play with more imagination. The Uenjoy Ride On Cars Children’s Electric Car can be connected to various devices via an aux or USB input which lets kids listen to music while driving around. After being fully charged, this car is able to last for around an hour of continuous play, which is plenty of time for kids. There are 2 speed settings that include low and high. The lower speed setting lets kids travel at up to 2.5 mph and the higher mode enables them to drive at 4 mph. There’s also a reverse feature available which can come in handy. The steering wheel is smooth to use and the foot pedal is easy for kids to keep control of the car. We liked how they’ve included a remote for parents that provides them with control over the car to keep their child as safe as possible. Children have been loving how they can choose between the different speed settings and listen to music. The remote that’s included ensures that parents are able to keep their kids safe too. This SLS AMG Mercedes Benz comes in a fantastic carbon black color that looks incredible. There are also tail lights, LED headlights, as well as fog lights! all of these lighting features make it feel more realistic for kids which helps them to play with more creativity. Kids can choose between a low and high speed setting which lets them travel from 3-6 mph. A reverse function is also available and can be very useful. We also liked how there is a remote control included for parents to use. This gives parents total control over the car to keep their child safe. The electronic braking system is effective at bringing your child to a stop every time. Furthermore, there’s an MP3 player available that lets kids listen to music and drive around. The design of this car is something that kids have been loving as they love pretending that they’re driving a real Mercedes. Their ability to play with a lot of imagination is boosted as a result of the realistic lights and design. 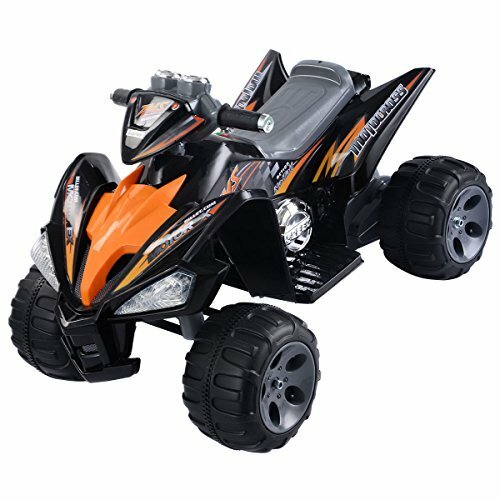 This Giantex ATV Quad Electric Toy features a 12V motor and comes with 2 speed settings. These speed settings are fantastic for enabling kids to select a low or high mode which you can adjust depending on your child’s experience level and age. There’s a reverse function available too which can be handy for kids to get themselves out of tricky situations. In addition to this, there are working headlights which make the toy car feel a lot more realistic to play with. As a result, kids feel encouraged to be highly imaginative. We liked how they’re used high-quality plastic materials to construct this one. It ensures that it will last your child for years of play. The seat is also fantastic for keeping your child comfy for long periods of play. 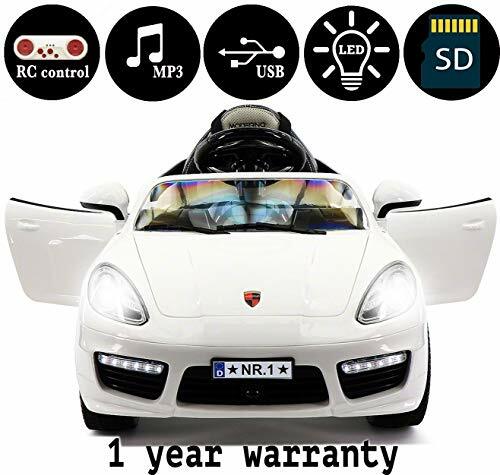 After being fully charged, this car can last for around 50 minutes of continuous play. Kids have a blast driving around in this toy car and being able to play with a lot of creativity as a result of the realistic headlight features. The Moderno Kids Ride On Toy Car for Children features 2 motors that are powered by a 12V battery. There are 3 speed settings available that lets you choose between low, medium, and high. The speeds range from 3-5 mph and kids are able to use the foot pedal to accelerate and the steering wheel to turn wherever they like. They’ve also included a remote that provides parents with total control over the car. Therefore, you can feel confident in knowing that you can keep your kids safe. A seat belt is also available to ensure that parents have even more peace of mind that they’re child will be safe. We were impressed with how there are working lights available as it makes it more realistic for kids to play with. This is awesome for inspiring them to play with more creativity. The MP3 player that has been fitted is also excellent as kids have a blast driving and listening to their favorite songs. The different speed settings mean that you have more control over how fast your child can drive their electric car. With music features and realistic lights, your child will also be able to play with a ton of imagination. 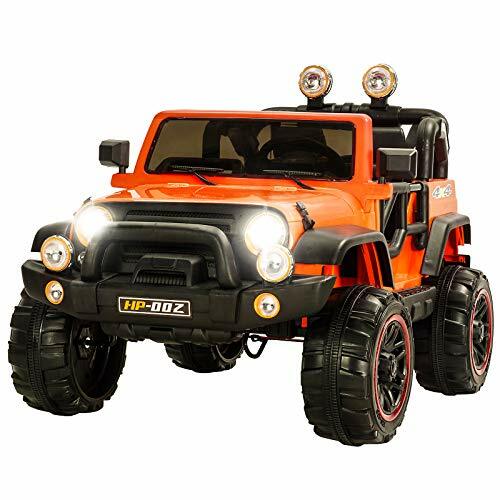 The Tobbi Kids Ride On Jeep Style Truck is powered by a rechargeable battery and is super easy to kids to start up as a result of the button start function. They’re able to drive both forwards and backwards which provides them with the freedom to more in any direction they like. The MP3 input that’s available enables children to listen to songs while driving around, which is a lot of fun. 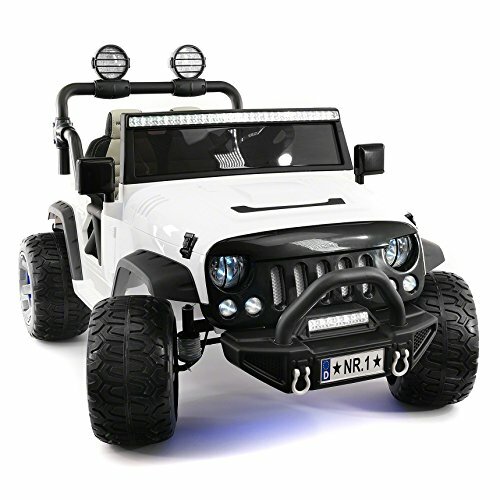 In addition to this, there are also Xenon LED headlights that provide the toy with a more realistic feel. This is awesome for inspiring kids to play with a lot more creativity. Parents have been pleased to find that this one features a remote control. Therefore, they’re able to have control over the car to keep their kids out of any danger. Kids have a blast driving around in this Jeep Style Truck and being able to listen to songs at the same time. The realistic light features are excellent for boosting their creative thinking skills too. 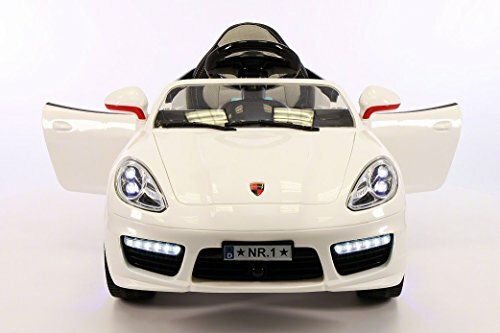 This Porsche Bokster Style Electric Kid’s Car is powered an electric battery and has a soft start function that’s easy for kids to use. The braking system is super reliable and works effectively to bring kids to a halt every time. We liked how they’ve used high-quality leather materials for the seat as it’s incredibly comfy. Therefore, kids can play for a long time without getting uncomfortable. There is an excellent 5-point seat belt available which ensures that your child remains safe while driving around. Kids have also been loving how they can listen to music via the MP3 input. In addition to this, there are LED lights available which makes the toy even more exciting for kids to play with. The design of this electric car is awesome and it feels realistic for kids to play with. As a result, their ability to be more creative is improved. 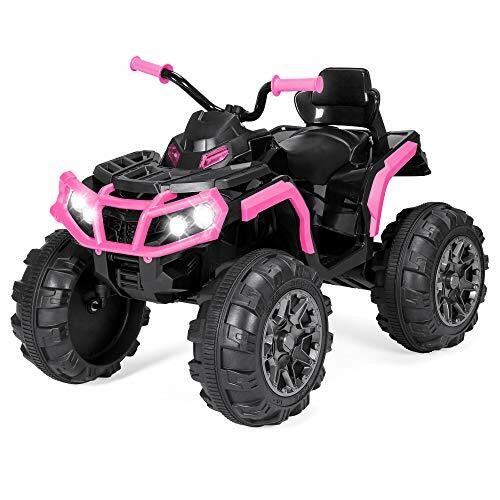 This ATV Quad comes with foot pedals that allow kids to accelerate forwards and backwards. There are also 2 speed settings that include low and high with a top speed of 3.7 mph available. We liked how there’s a built-in radio and an aux input as it provides kids with the chance to listen to their favorite music and drive. In addition to this, there are LED headlights and working horn available. these features are excellent for making the car toy feel more realistic, which is great for your child’s creative thinking skills. Due to the 4 wheel suspension system that has been fitted, kids can drive this electric car on dirt an grass without any issues. The large wheels also have a lot of tread to ensure that your child can drive safely on rougher surfaces. 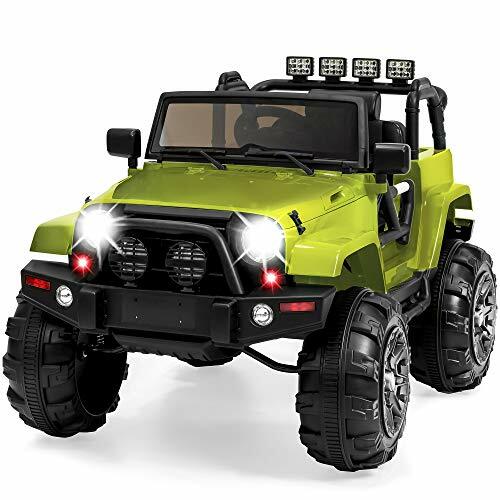 This is an awesome electric car that allows kids to drive it on off-road terrain as a result of the larger wheels and suspension system. This Kiddie Roadster Kids Electric Toy is a 12v battery operated car and uses 2 motors. This lets kids choose between slow and high speed settings that range from 2-4 mph. The braking system is reliable and easy for kids to use to remain safe. In addition to this, a seat belt is available to keep your child safe at all times and a remote control is included. Parents like having the reassurance of being able to use the remote to control the car to prevent any accidents. We liked how there are realistic lights and a working horn available with hit one. These features make the toy car feel more realistic and kids are able to play with more creativity as a result. they can also drive around while listening to music due to the MP3 input that has been built-in. People haven’t had any negative things to say about this one! 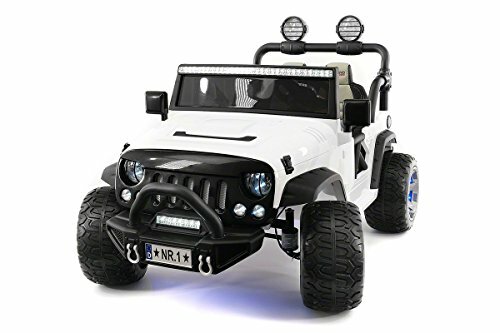 The LED headlights and working horn make this toy car a lot of fun for kids to play with imaginatively for hours. Parents are also given a peace of mind about their child’s safety by using the remote control. The Explorer Kids Car features an awesome 2-seat feature that lets 2 kids ride in it at the same time. This makes the experience even more exciting and can be effective at helping your child to develop their social skills. There are 2 speeds available that kids to change between, as well as a reverse function. However, parents are able to access a 3rd speed mode by using the remote control. This is an excellent safety feature that helps to prevent any accidents. Kids are able to drive at speeds between 2 and 5 mph. Seat belts are also available to keep both kids safe. We liked how there are LED lights available as they make the car seem more realistic. There is also a built-in Mp3 player that’s equipped with Bluetooth. Therefore, kids can connect the toy car to devices and listen to songs. 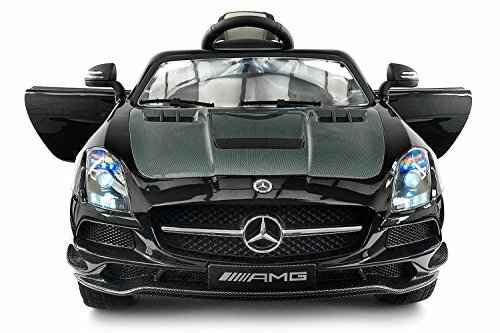 This is an awesome choice that lets 2 kids ride in the same toy car and have a lot of fun together. It can be great for your child’s social skills! 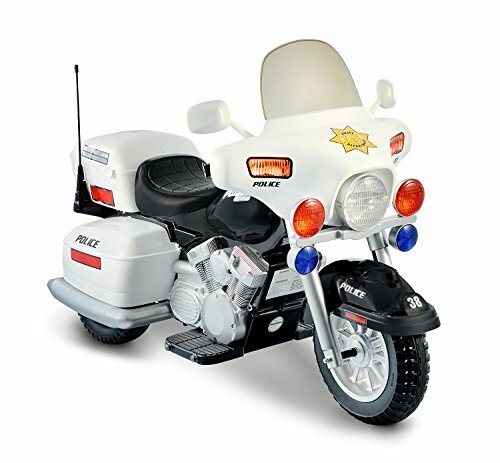 Kids have been having a lot of fun with this 12V Police Motorcycle. It included 2 forwards speeds that let kids travel between 2.5 and 5 mph. There’s also a reverse function which can come in handy with different situations. The accelerator is available on the handlebar and allows kids to control the speed of the toy. We also liked how there are signal lights and a working headlight. These are realistic features that inspire kids to play with more imagination. There are even side-view mirrors available. The overall attention to detail that has gone into the design of this one is remarkable. We liked how they’ve put a lot of attention into the detail with this toy as it makes it more realistic. As a result, kids are able to have a lot of fun and play with plenty of imagination. 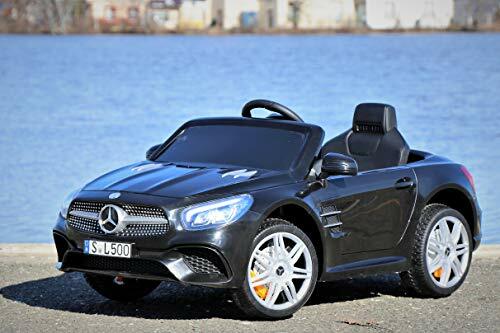 This Uenjoy Mercedes Benz SL500 Ride On Car comes with a foot pedal that lets kids control the speed of the toy, as well as a steering wheel that allows them to move it in different directions. There are 2 speeds available while kids are using the manual control. However, with the remote that’s available parents are able select a 3rd speed option. This remote also provides parents with control over the toy car to keep their kids out of danger. The rear and front wheels have been fitted with spring suspension systems that work effectively to ensure a smooth ride for your kids. A seat belt and lockable doors also ensure your child’s safety. Kids have a blast driving this electric car and pretending that it’s a real Mercedes. The lockable doors, seat belt, and remote control ensure that your child is able to play safely. The Vroom Rider VR093 has a 6V battery that lets kids travel at a maximum speed of 2 mph. In addition to this, there are training wheels included that provide the ride on toy with a lot more stability. Therefore, you can feel confident in letting younger kids ride this one. The lower speeds and training wheels ensure a safe and smooth ride. We were also impressed with how they’ve included headlights that actually work. This makes the toy feel more realistic for kids. Therefore, you can expect them to play with it in more imaginative ways, which is excellent for their creative thinking skills. This is one of the best options for younger kids who are 2 months and over because of the lower speeds and training wheels that are available. The HOVERHEART Electric Motorcycle Ride on toy is an excellent battery operated car that comes with 2 auxiliary wheels that are smaller than the main 2 wheels. These work well to provide your child with additional support to ensure that the bike can never tip over. Kids have a lot of fun being able to travel at speeds between 1.8 mph and 3.2 mph. The foot pedal makes the acceleration easy and they’re able to control their direction by turning the handlebars. The realistic design that has been used to construct this motorcycle toy is fantastic. It makes kids feel like they’re riding a real motorcycle, which inspires them to play for hours on end. 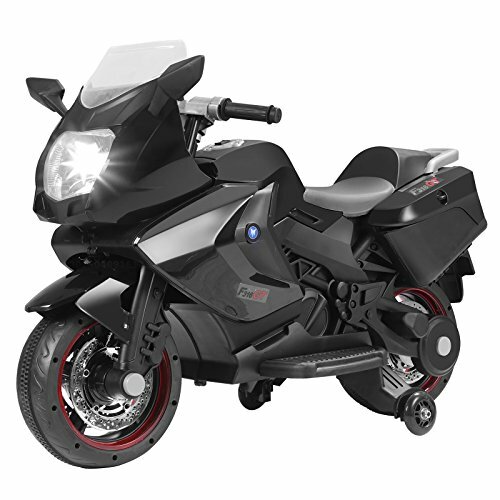 This is an awesome electric motorcycle toy that lets kids ride around safely as a result of the 2 auxiliary wheels that are available. The design of this one is also fantastic! Now that you know more about what the top electric cars for toddlers and kids have to offer, you can begin to narrow down your search and find the one that you think they would enjoy playing with the most. However, there are still quite a few options mentioned in this review and you may not be feeling 100% certain on the right one. If so, don’t worry. We’ve created this buying guide section to provide you with additional information. After reading through the review above, you will have seen that there is a number of different types of electric cars for kids and toddlers. If you were interested in learning more about the various types and what makes them distinguishable from one another, take a look below. There are numerous 4 wheeler options mentioned in this review. They usually come with larger tires and a fantastic suspension system that allows kids to drive their toy car on off-road surfaces. Children have a blast with 4 wheeler toy cars as they’re able to explore and be more imaginative with how they play. The Jeeps are fantastic for allowing kids to play creatively off-road. 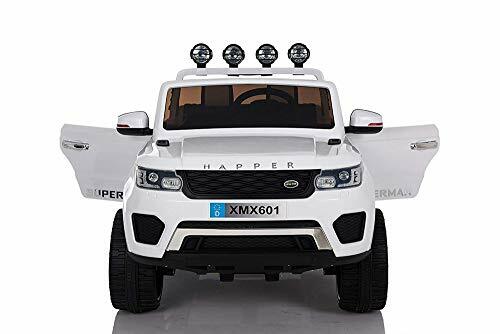 This is because the Jeep options reviewed in this post have been made with a realistic design which makes it more exciting for kids to play with. As a result, they feel encouraged to play with more creativity. 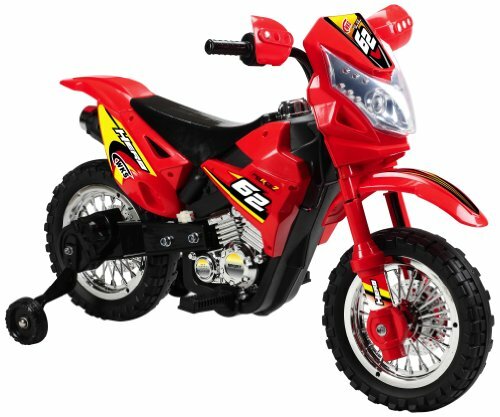 You may have seen that there are motorcycle options for electric vehicle toys available online. These ones may be best for older kids as they tend to involve a little more balance. Depending on the voltage, they may not necessarily be faster than the cars. 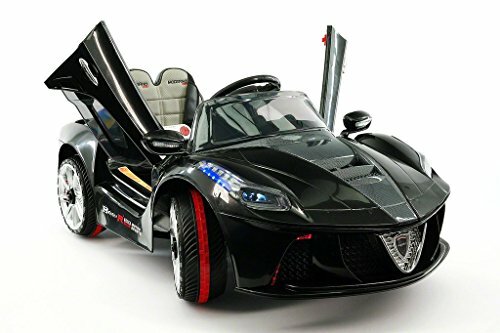 While learning more about what the best electric car toys have to offer, you will have seen that there is a number of top brands. If you wanted to learn a little more about what makes them such popular brands, this is the section for you. Power Wheels is a Fisher-Price line which lets you know straight away that their toys are going to be of an incredibly high-quality. Fisher-Price put all of their electric car toys through testing to make sure that they’re completely safe and up to standard. Big Toys Direct was established in 2010 and they’ve been focused on making fantastic toys that encourage children to use their imaginative thinking skills to play and have fun for hours. Their electric car toys come with a remote control that provides parents with total control over the car. Therefore, you can feel confident in knowing that this brand take safety seriously, while also ensuring that children have fun. Moderno Kids are known for making a wide variety of different toys. We like how their toys manage to be both fun and educational for kids. Their electric car range includes high-quality materials which allow kids to sit and play in comfort for hours on end. Are you feeling a little stuck on which electric car is best for your child’s age range? If so, you’ll want to check out this section for some additional guidance. 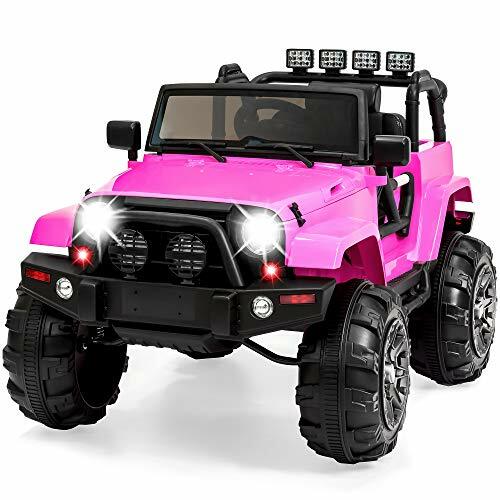 When it comes to finding an electric car toy for girls, the color will be a huge factor in your decision-making process. We recommend the Moderno Kids Mercedes CLA45 because of how it has been designed with such bright pink colors. Girls will have a blast pretending that it’s their real car and feel inspired to play with a ton of creativity. As far as boys are concerned, you’ll want to go with something that has a black color or a sports car design (or both!). That’s why the Moderno Kids Ride On Toy Car is a great choice for boys. They love the color and the sporty car design. Before you go ahead and make your final decision, there are a couple of other factors that you’ll want to take into consideration. Have a quick read below to learn more. One of the main aspects that parents are most concerned about when it comes to selecting an electric car toy for their child is the safety features. While reading through the options in this review, you will have seen that many of them come with a remote. This remote provides parents with the ability to control the toy car instead of their children. So, if at any stage, you see your child is heading for danger, you can use the remote to steer them away. Moreover, if you’re looking to purchase one of these toy cars for a toddler, you may want to keep complete control under they grow a little older. Manufacturers nowadays are very aware of how the safety features are a big factor. That is why nearly all of them come with seat belts for additional safety. Depending on the electric car that you decide to pick, you may need to consider replacement batteries. While the options in this review feature rechargeable batteries, some customers have reported a common complaint that the batteries wear down in terms of life span after being charged. Kids may end up being disappointed over time when their expecting to be able to play for an hour or longer, and their playtime gets cut short because of a battery that’s losing it’s durability. Therefore, we recommend grabbing replaceable batteries that you can use to easily swap out with old ones. That concludes our review on the best battery cars for kids that are currently available. Be sure to use all of the main features, pros, cons, age recommendations, and what makes each one stand out to help you make your final decision. Everything that you need to pick the best electric car toy for your kids can be found, right here!